Getting an orphan drug approved by the FDA is a home run. Epizyme is on track to submit two drug approvals on this new cancer drug. One form has no current drug therapy. Epizyme, Inc., a clinical stage biopharmaceutical company, discovers and develops novel epigenetic medicines for patients with cancer and other diseases in the United States. Its product candidates include tazemetostat, an inhibitor of the EZH2, which is in Phase II clinical trial for patients with relapsed or refractory non-hodgkin lymphoma (NHL); Phase II clinical trial for relapsed or refractory patients with mesothelioma; Phase I dose-escalation and expansion study for children with INI1-negative solid tumors; Phase II clinical trials for patients with relapsed or refractory diffuse large B-cell lymphoma (DLBCL); Phase Ib/II clinical trial in elderly patients with DLBCL; and Phase II clinical trial for relapsed or refractory patients with mesothelioma characterized by BAP1 loss-of-function,; and Phase Ib/II clinical trial for the treatment of patients with relapsed or refractory metastatic non-small cell lung cancer, as well as Phase II clinical trial in adult patients with ovarian cancer. The company is also developing additional programs, such as pinometostat, an intravenously administered small molecule inhibitor of DOT1L for the treatment of acute leukemias; and PRMT5 inhibitor that is in Phase I clinical trial for patients with solid tumors and NHL. Epizyme, Inc. has collaboration agreements with Celgene Corporation; Genentech Inc.; Glaxo Group Limited; Roche Molecular Systems, Inc.; Eisai Co. Ltd.; Lymphoma Study Association; and Boehringer Ingelheim. The company was founded in 2007 and is headquartered in Cambridge, Massachusetts. Company description from FinViz.com. In early January, Epizyme said it was planning to file for approval of its leading drug candidate, Tazemetostat, later this year. This drug is a late-line treatment for follicular lymphoma with EZH2 mutations. There are approximately 25,000 cases diagnosed annually. The Phase 2 data, showed an objective response rate (ORR) of 71% and complete remission of 11%. The ORR for patients with the wild-type EZH2 mutation saw a 6% remission. The company said the completed Phase 2 data could serve as a new drug application in Q2 for use in epitheloid sarcoma, a cancer without a drug therapy. Obviously, it takes some time for FDA approval but once approved this could be a very large cash flow in the hundreds of millions of dollars annually. Shares popped on the initial announcement in January then suffered a relapse on profit taking. This week EPZM has rebounded out of that dip and made a new 5-month high. 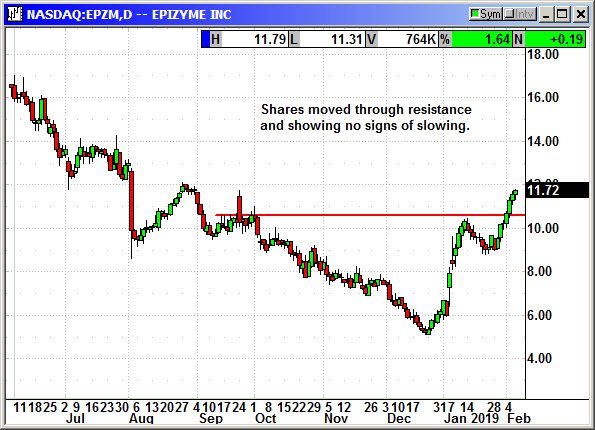 Buy EPZM shares, currently $11.71, stop loss $10.45. Optional: Buy March $12.50 call, currently $1.20, stop loss $9.85.